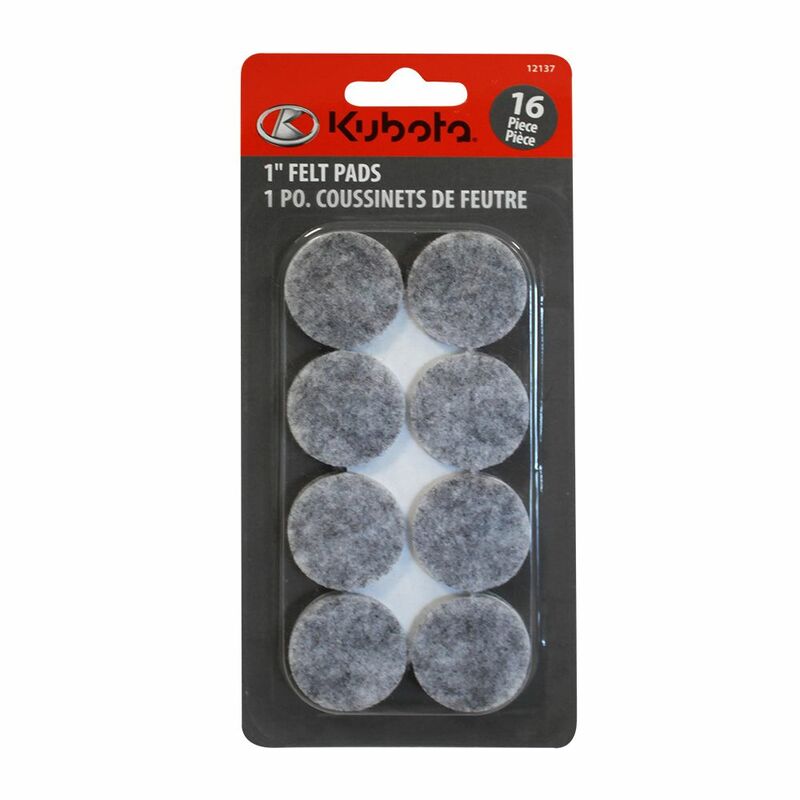 This Kubota 16pc Felt Pad Set is essential to protect flooring, table tops and furniture from scratches. Features quality felt and durable self-adhesive backing. Just peel and stick to create a non-scratch surface. Pads made from heavy duty recycled fibre polyester felt are superior to its traditional wool counterpart non-allergenic, improved durability and dries faster if it comes in contact with moisture. When used on legs of chairs, tables and other furniture will protect floor surfaces against marring and scratches while reducing noise and friction and enabling easy furniture movement. Best when used on hardwood and laminate, ceramic tile, terrazzo, linoleum, vinyl, and marble floor surfaces. On wood furniture, prepare surface for installation by cleaning and lightly sanding to ensure better adhesion of the pads. Remember to check periodically for wear and replace pads when appropriate. The 1-1/2 inch Felt guard Heavy-Duty Self-Adhesive Corner Felt Pads (8-Pack) is designed for use on wooden furniture legs. Our heavy duty felt pads prevent marring and scratching of furniture and floor surfaces such as hardwood, linoleum, vinyl and tile and reduces noise and friction while moving furniture across floor surfaces. The 1 inch and 1-1/2 inch Nail-On Glides with Felt guard Plus Felt Pads (20-Pack) work on wooden furniture legs. The heavy-duty felt pads prevent marring and scratching of hardwood, laminate and other hard surfaces, and they reduce noise and friction while moving furniture. The glides feature a nail-on design for easy installation. The 1 inch Nail-On Glides with 1 inch Felt guard Plus Heavy-Duty Felt Pads (8-Pack) is designed for use on wooden furniture legs. They prevent marring and scratching of hardwood, tile, linoleum and other hard surfaces, and they reduce noise and friction while moving furniture. The glides feature a nail-on design for easy installation. 16Pc 1 inch Felt Pad, 2 Pack This Kubota 16pc Felt Pad Set is essential to protect flooring, table tops and furniture from scratches. Features quality felt and durable self-adhesive backing. Just peel and stick to create a non-scratch surface.